Taliban commander suspected of deadly Pakistan school attack killed. 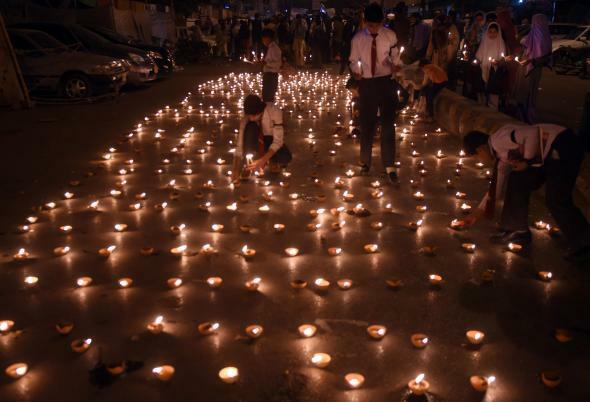 Students light earthen lamps for the victims of an attack by Taliban gunmen on an army-run school in Peshawar. A Pakistani militant who helped organize the horrific school attack in Peshawar last week that killed more than 100 children was killed on Thursday in northwestern Pakistan. The Taliban commander—known only as “Saddam”—was killed by Pakistani security forces in the Khyber tribal area on Thursday night, according to local officials. “Commander Saddam was a dreaded terrorist, who was killed in an exchange of fire with the security forces in Jamrud town of Khyber tribal region,” top local administration official Shahab Ali Shah told a press conference in Peshawar, according to Agence France-Presse. Saddam is also thought to be the mastermind of the deadly 2013 attack against polio vaccinators in the region, according to Pakistan’s Dawn newspaper.